Vijaynagar kingdom was one of the important kingdoms in the medieval Indian history. Vijaynagar Dynasty rules over India for 3 centuries. It is a history full of wars with Bahamani and other muslim rulers of northern Deccan, collectively said as Deccan sultanates. Vijayanagara is in Bellary District of northern Karnataka. It is the name of the now-ruined capital city of the historic Vijayanagar Kingdom which extended over the southern part of India that included the territories of Mysore, Trichinopally, Kanara, Pondicherry, Chingalpet and Kanchivaram. Two brothers Harihara (Hakka) I and Bukka Raya laid the foundation of the Vijaynagar city, which was on the South bank of Tungabhadra River near Anegudi Fortress. They were also known as Sangama brothers. Vijaynagar Empire consolidated under Harihara I and began to expand and prosper under Bukka Raya which was more defensible and secure for its location between 14th and 16th century. It is said that a sage Madhav Vidyaranya and his brother Sayana were the inspirational source for this empire. The rulers were strict worshipers of the Hindu Gods and Goddess, but also tolerant towards the other religions. The emperors were great patrons of art and culture. The region influenced a development in the streams of music, literature and architecture. Many temples built in the territories of the south represent the style of Vijaynagar kingdom. The economy of the region flourished and several coins were introduced during the reign of the rulers of the Vijaynagar Empire. There were four dynasties ruled over Vijaynagar — Sangama Dynasty, Saluva Dynasty, Tuluva Dynasty and Aravidu Dynasty. Sangama dynasty (1334 – 1646CE) was the first to rule over Vijaynagar kingdom. Hariharan I and Bukka established Vijaynagar kingdom when Tughlaqs lost his power in Deccan. But its power declined after a major military defeat in 1565 by the Deccan Sultanates. He is known as Hakka and Vira Harihara I. He was the founder of Vijaynagar Empire, which was at south based in the Deccan Plateau. He was Bhavana Sangama’s eldest son, belonged to the Kuruba (or Kurumas are Dhangaras in Southern states of India) and was the founder of the Sangama dynasty. [Some people believe that he was from Yadava clan]When he came to the power, he immediately built a fort at Barkuru which is at the west coast of present day of Karnataka. It is concluded from the inscriptions that he was administering the northern parts of Karnataka at Gutti, Ananthpur district from his seat during 1339 period of time. Harihara was controlling northern portion of Hoysala kingdom. After death of Hoysala Veera Ballala III, he took full control over its entire range during 1343. He was famous by the names Karnataka Vidya Vilas (master of great knowledge and skills), Bhashegetappuvarayaraganda (punisher of those feudatories who don’t keep their promise), Arirayavibhada (fire to enemy kings). Kampana governed Nellur region, Muddppa administered Mulabagalu region, Marappa oversaw Chandragutti and Bukka Raya was his second in command. So overall his kingdom was well organized. Bukka Raya ruled the kingdom for about twenty one years. The kingdom prospered and continued to expand as Bukka Raya conquered most of the kingdoms of southern India, continually expanding the territory of the empire. He defeated the Shambuvaraya Kingdom of Arcot and the Reddis of Kondavidu by 1360 and the region around Penukonda was annexed. He defeated the Sultanate of Madurai in 1371 and extended his territory into the south all the way to Rameswaram. His son, Kumara Kamapna campaigned with him and their efforts were recorded in the Sanskrit work Madhuravijayam written by his wife Gangambika. By 1374 he had gained an upper hand over the Bahmanis for control of the Tungabhadra-Krishna doab and also took control of Goa, the kingdom of Orissa (Orya) were also captured and Bukka forced the Jaffna Kingdom of Ceylon and Malabar to pay tributes to him. During his reign Bukka would also have clashes with the Bahmani Sultans. The first was during the time of Mohammed Shah I and the other during the time of Mujahid. It is said that Bukka also sent a mission to China during his reign. Bukka died in about 1380 and was succeeded by Harihara II. It is also notable that under Bukka Raya’s reign the capital of the Vijayanagara Empire established itself at Vijayanagara, on the south side of the river, which was more secure and defensive than their previous capitol at Anegondi. Even with the wars and internal conflicts, Bukka still managed to help support internal improvements for the city. Important works of literature were also written during his rule. Dozens of scholars lived under the guidance of Vidyaranya and Sayana. Sayana’s commentary on the Vedas, Brahmanas and Aranyakas was written under the petronage of Bukka. During his reign, Harihara II continued to extend the kingdom’s territory through fighting against the Reddis of Kondavidu for control of the coastal Andhra between Nellore and Kalinga. From the Reddis of Kondavidu, Harihara II conquered the Addanki and Srisailam areas as well as most of the territory between the peninsula to the south of the river Krishna, which would eventually lead to fights in Telangana with the Velamas of Rachakonda. Harihara II took advantage of the death of Mujahid Bahmani in 1378 and extended his control into the northwest, controlling such ports as Goa, Chaul, and Dabhol. 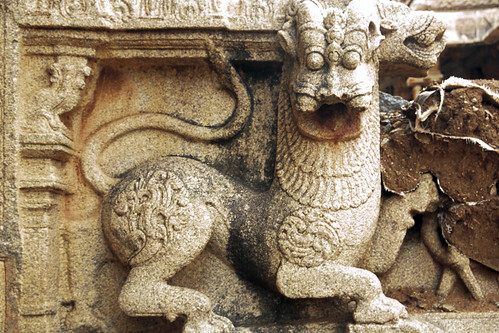 Harihara ruled from the capital Vijayanagara now more popularly known as Hampi. What is believed to be the ruins of Harihara’s palace is located among the Hampi ruins. He patronised Kannada poet Madhura, a Jaina. An important work on Vedas was completed during his time. He earned the titles Vaidikamarga Sthapanacharya and Vedamarga Pravartaka. After the death of Harihara II the succession of the thrown was disputed among Harihara II’s sons. Virupaksha Raya managed to rule for a few months before he was murdered by his own sons. After Virupaksha’s death, Bukka Raya II succeeded him as emperor of the Vijayanagara Empire. However, similar to his brother before him, Bukka Raya II only reigned for a short time period before he too would be overthrown by his brother, Deva Raya I. After Harihara II died there was a dispute between his sons for the throne of the Vijayanagara Empire in which Deva Raya I eventually come out as victor. Throughout his reign, Deva Raya was continually fought against the Velamas of Telangana, the Bahmani Sultan of Gulbarga, and the Reddis of Kondavidu and the Gajaptis of Kalinga. Even so, Deva Raya was be capable of managing the vast amount of territory that he controlled. After his death, Deva Raya was be succeeded by his sons Ramachandra Raya and Vijaya Raya. Ramachandra Raya was the son of Deva Raya I who became king of the Vijayanagara Empire after his father’s death in 1422. Throughout his reign there were no recorded significant changes in territory or major events. Afterwords, he would be succeeded by his brother, Vijararaya, in the same year who was not noted for doing anything significant. Veera Vijaya Bukka Raya was the son of Deva Raya I and succeeded his brother, Ramachandra Raya, in 1422 as the king of the Vijayanagara Empire. Similar to Ramachandra Raya, Vijaya Raya is not known for doing anything significant and his short reign ended in 1424 when he was succeeded by his son, Deva Raya II. Deva Raya II succeeded his father Veera Vijaya Bukka Raya after his short uneventful two year reign was a monarch of the Vijayanagara Empire. Unlike his father, Deva Raya II was an effective and successful monarch. During his reign, Deva Raya II prevailed over his conquest of Kondavidu in 1432, repelled the invasions of Ahmad Shah I of the Bahamanis and retained the Mudgal fort in 1436 but lost some areas in the Raichur doab in 1443, defeated the Gajapati of Orissa three times in 1427, 1436 and 1441, restored the Reddi Kingdom of Rajamahendri to its former position, fought against the Sultan Ala-Ud-Din, and continued onwards to Kerala where he defeated the ruler of Quilon as well as other chieftains. He invaded Lanka and collected rich tributes there. The ruler of Calicut and even the kings of Burma ruling at Pegu and Tanasserim paid tributes. Mallikarjuna Raya succeeded his father Deva Raya II, who had brought prosperity throughout the Vijayanagara Empire as well as a golden age for the Sangama Dynasty. However, Mallikarjuna Raya was unlike his father, and was generally a weak and corrupt ruler. At the beginning of his reign he defended the kingdom from the attacks of the Bahamani Sultan and the Raja of the Hindu kingdom of Orissa, but thereafter it was marked by a string of defeats: the Gajapatis conquered Rajamahendri in 1454, Udayagiri and Chandragiri in 1463 and the Bahamani kingdoms took over much of the Vijayanagara Empire by 1450 and grew closer to the capital, while at the same time the Portuguese arrived in southern India, seizing many of the ports on the western coast that the Vijayanagara Empire had once controlled. These events eventually led to the decline of the Sangama Dynasty; Mallikarjuna Raya’s cousin Virupaksha Raya II took the opportunity to seize the throne, though he failed to prove a better ruler. Virupaksha Raya II succeeded his uncle, Mallikarjuna Raya, a corrupt and weak ruler who continually lost against the empire’s enemies. 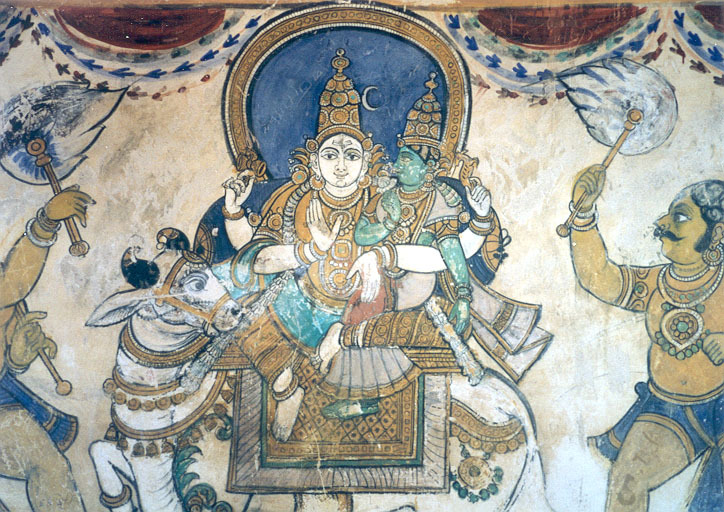 Throughout his reign, Virupaksha was faced with rebellious nobles and officers as well as multiple enemies who began to invade the weakened kingdom. It was during this time that Virupaksha Raya II lost the Konkan coast (including Goa, Chaul, and Dabul) by 1470 to Prime Minister Mahamud Gawan from the Bahamani kingdom, which was sent to conquer the area by the Sultan Muhammad Shah III. Virupaksha became increasingly unpopular and ignited many of the empire’s provinces to rebel, eventually leading up to Virupaksha’s death in the hands of his own son, Praudharaya in 1485. Praudharaya himself was not able to salvage the kingdom but fortunately, an able general Saluva Narasimha took control of the empire in 1485 and helped to prevent its demise, though this change of power would mark the end of the Sangama Dynasty and the beginning of the Saluva Dynasty. He was an unpopular king of Vijayanagara Empire who ruled for a very short period of time being driven out of the capital by his able commander Saluva Narasimha Deva Raya in 1485. He wrote Ratiratnapradipika, a book on erotics. One of the ruling dynasty from Vijaynagar Empire of Southern India. Saluva Dynasty had given three kings during their period. The Saluva Dynasty was created by the Saluvas who by historical tradition were natives of the Kalyani region of northern Karnataka. The Gorantla inscription traces their origins to this region from the time of the Western Chalukyas and Kalachuris of Karnataka. The term “Saluva” is known to lexicographers as “hawk” used in hunting. They later spread into the east coast of modern Andhra Pradesh, perhaps by migration or during the Vijayanagara conquests during the 14th century. The earliest known Saluva from inscriptional evidence in the Vijayanagara era was Mangaldeva, the great grandfather of Saluva Narasimha Deva Raya. Mangaldeva played an important role in the victories of King Bukka Raya I against the Sultanate of Madurai. His descendents founded the Saluva Dynasty and were one of the ruling lines of the Vijayanagara Empire of Southern India. Three kings ruled from 1485 to 1505 after which the Tuluva Dynasty claimed the throne. They ruled almost the entire South India with Vijaynagar as their capital. After the death of Virupaksha Raya II and arrival of Prauda Deva Raya as the new monarch of Vijayanagar, the empire plunged into neglect and anarchy. Seeing that a military coup was the only hope to save the kingdom, he despatched the son of Tuluva Isvara, Tuluva Narasa Nayaka to the imperial capital of Vijayanagara. The incumbent king Prauda Raya fled thus starting the rule of Saluva Narasimha. As king, Saluva Narashima tried to expand the empire, though he continually faced difficulties caused from rebelling chieftains. By 1491, he lost Udayagiri to Gajapati Kapilendra while the Chiefs of Ummattur in the Mysore region, Saluvas of Hadavalli and Santharas of Karkala from coastal Karnataka region, Srirangapatna and Sambetas of Peranipadu in Cuddapah still remained threats to the empire. Saluva Narashima’s war with the Gajapatis over Udayagiri in 1489 proved disastrous when he was taken prisoner and released later after giving up the fort and surrounding areas. However he was successful at conquering the western ports of Kannada country of Mangalore, Bhatkal, Honnavar and Bakanur. This success enabled him to trade for swift horses with the Arabs. He took more efforts in the upkeep of his cavalry and army in general. Saluva Narashima eventually died in 1491. However, at the time, his sons were too young to ascend to the throne. Because of this, the sons were left to the care of Narasa Nayaka, a loyal general and minister from the Tuluva family. He was the elder son of Saluva Narasimha Deva Raya, the King of Vijayanagara Empire. During the reign of his father, he was holding the office of Yuvaraja. Prince Thimma succeeded his father in 1491 but was soon murdered by an army commander during a period of political unrest in Vijayanagara. He was succeeded by his younger brother Narasimha Raya II. or Immadi Narasimha or Dhamma Tammaraya was the second son of King Saluva Narasimha Deva Raya. Narasimha Raya II succeeded by his elder brother Thimma Bhupala. Though he was a crowned king of Vijayanagara Empire, the real power lay in the hands of the empire’s able commander Tuluva Narasa Nayaka till his death in 1503. Narasa Nayaka, under the pretence of his safety, kept him in confinement at Penukonda. In 1503, after the death of Narasa Nayaka, his eldest son Viranarasimha Raya became the regent of the empire. In 1505, Narasimha Raya II was murdered in Penukonda and Viranarasimha Raya proclaimed himself king. This is known as a third Dynasty which ruled Vijaynagar Empire. The dynasty was named “Tuluva” because they belonged to the Tulu speaking region called “TULUNAD” and their mother tounge was “Tulu” language. They were originally from Karnartaka. Tuluva Dynasty was one of the ruling lines of the Vijayanagara Empire of Southern India. 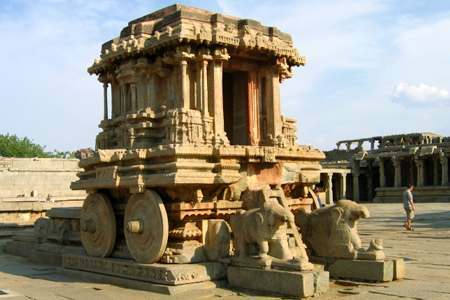 It had given five emperors for the Vijaynagar kingdom and was ruled with Vijayanagara capital. Krishna Deva Raya was the most famous ruler of their period. The empire attained it greatest glory of time. *Tuluva Narasa Nayaka (1491-1503 CE) who belonged to the Bunt community (Tulu speaking forward class Matrilineal Hindu community beloning to the Nagavanshi Kshatriya, order found mainly in southern coastal Karnataka) was the able commander of the Vijayanagar army under the rule of Saluva Narasimha Deva Raya and the de-facto sovereign during the nominal rule of the sons of Saluva Narasimha. After the death of King Saluva Narasimha, crown prince Thimma Bhupala was murdered by an army commander. The faithful Narasa Nayaka then crowned the other prince, Narasimha Raya II but retained all administrative powers in order to bring stability to the kingdom. He was called the rakshakarta (protector) and svami (Lord). He held the offices of the senadhipati (commander-in-chief), the mahapradhana (Prime Minister) and the karyakarta (agent) of the king. He successfully kept the Bahamani Sultans and the Gajapatis away from the kingdom and quelled many rebellions by unfaithfull chieftains, trying to exert their independence. *Viranarasimha Raya (1503-1509 CE) who belonged to the Bunt community became the king of Vijayanagar empire after the death of Tuluva Narasa Nayaka. The younger Krishnadevaraya was the king’s half brother. The death of their capable father Tuluva Narasa Nayaka resulted in feudatories rising in rebellion everywhere. At first, Immadi Narasa Nayaka, the eldest son of Tuluva Narasa Nayaka became king and lasted at the throne for two years before being assassinated. Viranarasimha Raya was next crowned in 1505 and spent all his years fighting rebel warlords. When on his death bed, legend has it that Viranarasimha Raya requested his minister Saluva Thimma (Thimmarasa) to blind Krishnadevaraya so that his own eight year old son could become king of Vijayanagar. Thimmarasa however brought a pair of she-goat eyes to the king and informed him that he had Krishnadevaraya killed. However there is no record to prove anything but a friendly relationship between the two half brothers and that the coronation of Krishnadevaraya was a smooth one. Sri Krishna Deva Raya was the most famous king of Vijayanagara Empire. He belonged to the tuluva bunt community. Presiding over the empire at its zenith, he is regarded as a hero by Tuluvas, Kannadigas and Telugus, and one of the great kings of India. Emperor Krishna Deva Raya also earned the titles Kannada Rajya Rama Ramana, Mooru Rayara Ganda (meaning King of three kings) and Andhra Bhoja. Krishna Deva Raya was assisted in administration by the very able Prime Minister Timmarusu, who was revered by the king as a father figure and was responsible for his corronation. Krishna Deva Raya was the son of Nagala Devi and Tuluva Narasa Nayaka an army commander under Saluva Narasimha Deva Raya, who later took control of the reign of the empire to prevent it from disintegration. The king’s coronation took place on the birthday of Lord Krishna and his earliest inscription is from July 26, 1509 CE. He built a beautiful suburb near Vijayanagara called Nagalapura in memory of his mother. *Achyuta Raya (1529-1542 CE) who belonged to the Bunt community was a ruler of a Vijayanagara Empire of South India. He was the younger brother of Krishna Deva Raya, whom he succeeded in 1529. Upon his death, the succession was disputed. His nephew, Sadashiva, finally became king while yet a child, under the regency of Aliya Rama Raya, a son-in-law of Krishnadevaraya. The time when Achyuta Raya became the king was by no means a favorable one. The peace and prosperity of the halcyon days under Krishnadevaraya were coming to an end. Feudatories and enemies were waiting for an opportunity to bring down the empire. In addition, Achyuta Raya had to contend with the powerful Aliya Rama Raya, who was competing for the throne. While the works of Nuniz speak very lowly of Achyuta Raya as being a king given to vices and cruelty, there is enough evidence to prove that the king was indeed noteworthy in his own right and fought hard to keep the prosperity of the kingdom alive. He had been handpicked by Krishnadevaraya himself as an able successor. Ismail Adil Shah of Bijapur invaded and captured the Raichur doab. However the Gajapati’s of Orissa and Quli Qutub Shah of Golconda were defeated and pushed back. Now Achyuta Raya along with his general Salakaraju Tirumala went on a southern campaign to bring the chiefs of Travancore and Ummatur under control. This they did successfully. Then they invaded the doab north of Tungabhadra and recaptured the forts of Raichur and Mudgal. The two Sanskrit works Achyutabhyudayam and Varadambikaparinayam describe the kings life and rule in detail. Throughout his rule, Achyuta Raya had to contend with the manipulations of Rama Raya who in his powerful capacity had replaced many of the faithfull servants of the Kingdom in high ranking positions with men of his own favour. On more than one occasion the Bahamani Sultans were brought in to play the role of mediator between the king and Ailya Rama Raya in the game of power sharing. This would further weaken the kingdom. In 1542 Aliya Rama Raya imprisoned Achyuta Raya in a coup and made Sadasiva Raya the new regent. Aliya Rama Raya became the de-facto king and let very little governance in the hands of Sadasiva Raya. The Tiruvengalanatha Temple was built at Vijayanagara during his reign. It has become popularly known by his name as Achyutaraya Temple, rather than by the name of the deity Lord Venkateshwara to whom the temple was dedicated. *Sadashiva Raya (1542-1570) who belonged to the Bunt community was a ruler of the Vijayanagara Empire, a powerful South Indian empire based in the Deccan in 16th century India. When the Vijayannagara ruler, Achyuta Raya died in AD 1541, his son, Venkatadri, succeeded him. He was a weak ruler and six months later his cousin, Sadasiva, became king. Sadasiva Raya was controlled by his minister Rama Raya, the de facto king, who restored the Vijayanagara empire’s power which had diminished after the rule of Krishna Deva Raya. Rama Raya’s strategy was to play the Deccan Sultanates against each other by first allying with one and then another. This was the fourth and last Hindu dynasty which ruled Vijaynagar Kingdom in South India. Rama Raya was the regent of Tuluva kingdom’s last king. Tirumala was the founder of Aravidu kingdom. The attack of combined Muslim forces from Bijapur led the Ram Raya to be dead at the battle of Rakasa at Tangadi or Taikota in 1565 and destructed the Vijaynagar kingdom. The Aravidu Dynasty was the fourth and last Hindu dynasty which ruled Vijayanagara Empire in South India. Its founder was Tirumala, whose brother Rama Raya had been the masterful regent of the last ruler of the previous dynasty. Rama Raya’s death at the Battle of Rakasa-Tangadi (also known as the Battle of Talikota) in 1565 led to the subsequent destruction of Vijayanagar by the combined forces of the Muslim states of Bijapur. *Aliya Rama Raya or Rama Raya, (1542-1565 CE) popularly known as “Aliya” Rama Raya, was the progenitor of the “Aravidu” dynasty of Vijayanagar Empire. This dynasty, the fourth and last to hold sway over the Vijayanagara Empire, is often not counted as a ruling dynasty of that empire, for reasons delineated below. Rama Raya patronised the Sanskrit scholar Rama Amatya. *Tirumala Deva Raya (1565-1572 CE) was the first Crowned King of the Vijayanagara Empire from the Aravidu Dynasty. He was the brother of the Aliya Rama Raya and son-in-law of Krishna Deva Raya. When Rama Raya was killed in the Talikonda battle in 1565 he immediately emptied the treasury and fled the capital to taking with him the Royal family and the minor crown prince Sadasiva Raya. He, after a few years of hardships, reestablished the Vijaynagar rule in Penukonda, in present day Andhra Pradesh. During this time the Southern Nayakas of Madurai and Gingee declared partial independence, while some others rebelled over Tirumala Deva Raya’s authority. In 1567 he encountered another attack by the Bijapur Sultan; this time the Sultan was defeated, but also lost some territories. Tirumala Deva Raya later tactfully approved the new status of Southern Nayaks, who still paid some tributes and held him as their emperor. Tanjore and Mysore rulers still paid the annual tributes while Madurai and Gingee rulers grudgingly followed. Tirumala Deva Raya also retained most of the Vijaynagar territories and assumed the title “Reviver of the Decadent Karnataka Empire”. In 1570 he split the Viceroyalty among his three sons: Sriranga I in Penukonda in charge of Telugu country, Rama (father of Sriranga II) in Sritrangapatna in charge of the Kannada country and Venkatapathi (a.k.a. Venkata II) in Chandragiri in charge of Tamil country. Penukonda was the Capital of the empire. The King retired in 1572 after feeling too old to rule and retired to a religious life of living till 1578. *Sriranga I/Sriranga Deva Raya (1572-1586 CE) was the king of Vijayanagara empire, from 1572-1586. He carried the restoration of the Vijayanagara Empire, but his reign was marred with repeated attacks and loss of territories from his Muslim neighbours. In 1576, Ali Adil Shah laid siege to his fort in Penukonda for three months, but at the end Sriranga I bought out the Adil Shah’s Hindu lieutenants which helped his commanders defeat the Sultan’s army. In 1579, Sultan’s new commander Murari Rao, a Maratha Brahmin, launched a sudden plundering operation heading a large Muslim army. His hordes began systematically ravaging the territory south of the River Krishna with great ferocity. Chennappa Nayaka , a general of Recherla Velama dynasty was sent to defeat the Golkonda raiders but the magnitude of Atorcities committed by the invaders alerted Sriranga I who also hurried to parry the attack. Murari Rao and his Golkonda raiders were defeated, Murari Rao was pursued by Chennappa who captured and imprisoned him in a cage. By 1580, Sriranga I turned the tide and started chasing the Golkonda army northwards recovering the territory they had seized. Sriranga I generously spared the life of Murari Rao because of his brahminical origins. Ibrahim Qutb Shah, the new Sultan was furious and decided to settle the matters himself and invaded Kondavidu with the rest of his army and took the Udayagiri fort. Then he launched a massive raid on Udayagiri and slaughtered the locals, but Sriranga I kept the fight on and repulsed Sultan’s army from Udayagiri after an initial retreat. Unfazed, Qutb Shah struck at Vinukonda and seized the fort. Sriranga I, along with Chennappa and Kasturiranga , rushed to Vinukonda and after a fierce battle the Sultan’s army was defeated and sent back. Later, Sriranga I’s troops, under Chennappa, stormed the fort of Kondavidu while the later died fighting even as he forced the Sultans army to retreat. Despite the loss of territories, which was higher this time, Sriranga I also had a difficult time with his uncooperative brothers and noble men and continued to resist with limited resources as the Nayaks of Madurai and Gingee evaded on paying annual tributes. Sriranga I died in 1586, without an heir and was succeeded by his youngest brother Venkatapathi Raya (Venkata II). *Venkata II/Venkatapati Deva Raya(1586-1614 CE) the younger brother of Srirangal became the King of Vijayanagara Empire from 1586-1614.His reign of three decades saw a revival of strength and prosperity of the empire. He dealt successfully with the Deccan sultans of Bijapur and Golkonda, the internal disorders, promoting economic revival in the country. He brought rebelling Nayaks of Tamil Nadu and parts of present day Andhra Pradesh under control. *Sriranga II/Sriranga Chika Raya (1614-1614 CE) was nominated in 1614 by King Venkata II to succeed him as king of the Vijayanagara Empire in Southern India. Sriranga was supported by a faction headed by Yachamanedu of Recherla Velama dynasty , one of the Venkata II’s loyal viceroys and commanders, but was not favored by a set of nobles headed by Gobburi Jagga Raya, brother (or father) of Venkata II’s queen. ascended the throne after a gruesome war in 1617 as the King of Vijayanagara Empire. In 1614 his father,Sriranga II the preceding King and his family were gruesomely murdered by rival factions headed by Jagga Raya, who was one of their kins. Rama Deva himself was smuggled out of the prison by Yachamanedu, a faithful commander and the viceroy of earlier king Venkata II. *Venkata III/Peda Venkata Raya (1632-1642 CE), the grandson of Aliya Rama Raya became the King of Vijayanagara Empire. *Sriranga III (1642-1646 CE) or Sriranga Raya II (1642 – 1652 CE)?? was the last ruler of the Vijayanagara Empire, who came to power in 1642 following the death of his uncle Venkata III. He was also a great grandson of Aliya Rama Raya.